An initial consultation—to determine if we make a good fit for one another. Two prenatal visits—to assess your needs and desires for your birth experience, to align and understand our expectations of one another, and to provide you with useful information, tools, and techniques for labor and birth. Birth plan assistance—to help you clarify your preferences for birth and explain the options that are available to you. This step often includes information sharing so that you feel informed about your birth options. Nonstop emotional, physical, and informational support to you and your birth partner for the duration of labor and birth—to assist as you and your partner realize the vision you hold for your baby’s birth. Initial breastfeeding support immediately after birth, if desired—to help your baby latch on properly and encourage the establishment of breastfeeding. 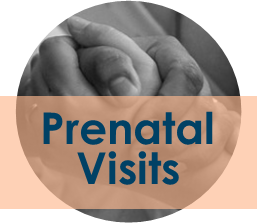 A postpartum visit—to celebrate the birth of your baby and to discuss questions, concerns, and joys you have during the early postpartum period. 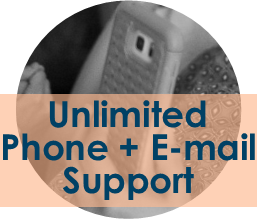 Unlimited phone and e-mail support throughout your pregnancy, early labor, and early postpartum period—to answer your questions and to offer suggestions and support. For more detailed descriptions, appointment-setting, and pricing, I invite you to read more below. The initial consultation allows us to meet in-person in a casual setting and to have a conversation. During the course of the meeting, we typically discuss aspects of your pregnancy thus far, some of the desires you envision for childbirth, and how you envision a doula potentially fitting into your birth experience. The initial consultation usually lasts around one hour or so, and there is no expectation of commitment from you. After we first meet, I encourage you and your birth partner to reflect on what you thought of our meeting—if you feel a connection and want to move forward, then great! We proceed by completing our contract. If not, then great as well—I remain a supporter of you having the exact birth experience you desire. There is no cost either way for the initial consultation. As soon as you and your birth partner are ready for me to join you in labor, I provide continuous, focused attention to you. You are my only priority. This is true regardless of the length, location, and development of your labor. I support you emotionally by offering gentle, encouraging words, never leaving your side, listening to you, encouraging communication with your maternity care team, and more. 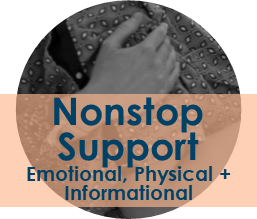 I support you physically by offering comforting, non-medical touch—such as light massage and counter-pressure—position suggestions, demonstrating how your birth partner can physically support you, and more. I support you informationally by interpreting options provided to you in labor, offering additional details, reminding you of your birth preferences plan, and more. I remain present through your entire labor and birth so you can rest assured that someone will always be present as you take on this incredible journey and realize the vision you hold for your baby’s birth. Once you have hired me as your birth doula, we will arrange two prenatal visits respective of your due date. These meetings are entirely designed around you, your birth partner, and your collective goals for your birth, and are thus completely personalized. Typically, these visits provide us the opportunity to really get to know each other and develop a relationship, discuss your pregnancy and childbirth desires at length, determine how I can individualize my support to you in labor, talk through information, concerns, joys, and questions, practice comfort measures, and more. Each meeting usually lasts around two hours or so and take place wherever you are most comfortable, typically in your home. I will always be available to you by phone, text, and email throughout your pregnancy, early labor, and early postpartum period to answer your questions and to offer suggestions and support. I ensure that I am responsive to you and your needs. My priority is that you trust that you always have another person on your birth team available to offer you support when and how you desire it. Whether you have a birth plan in hand or have never considered one, I will help you create or refine a birth preferences plan to provide to you maternity care team. If you desire one, then plan development can help as you explore the various options available to you. I provide resources and explanations so that you are fully equipped with all the information you need to articulate your preferences for your birth experience, all with a physical document to support you. If breastfeeding, I offer instruction and suggestions to help your baby latch properly and to provide you optimal comfort. This early assistance aids in developing a healthy and meaningful breastfeeding experience for you and your baby. The postpartum visit allows for us to meet in-person again after birth to celebrate your baby and to discuss questions, concerns, and joys you have during the early postpartum period. I continue to provide whatever emotional, physical, and informational support you desire. This postpartum meeting can vary in length, and typically takes place in your home. While visits usually take place within a couple of weeks of birth, I will come as soon as you are ready for me. I currently offer a special pricing of $250 on my birth doula services. 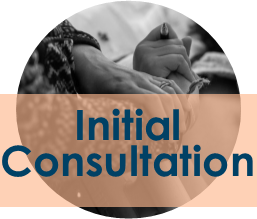 Interested in booking an initial consultation? Contact me directly or click below to schedule online! Attending a birth will always be an incredible privilege for me. However, attending your birth is a particularly incredible privilege for me as I finish my certification process. Thus, while my services are valued at $500, I offer a reduced fee of $250 for the births I attend in a certifying capacity.